Single-port access (SPA) laparoscopic surgery has been reported for appendectomies, cholecystectomies, and several urology procedures. In addition, single-port hysterectomy was also reported in the early 1990s. We describe our method of performing single-incision total laparoscopic hysterectomy with endosuturing. Preoperatively, all the patients are kept on liquid diet for a day and bowel preparation is done with Exelyte solution. All the surgeries are performed under general anesthesia with the patient in modified lithotomy position. The Veress needle is inserted at the umbilicus in most patients and in selected patients with previous surgeries, the Palmer's point is used. The Palmer's point  (a point 3 cm below the left costal margin in the midclavicular line) is a safe zone in all patients other than those with splenomegaly. After insufflations with carbon dioxide, a 2 cm incision is made at the lower margin of the umbilicus. A 10 mm trocar is introduced into the incision. We always prefer to use the 30 degree telescope for advanced laparoscopic procedures. Two 5 mm accessory trocars are introduced on either side of the optical trocar [Figure 1] and [Figure 2]. The uterus is manipulated by a 5 mm myoma spiral from the accessory port [Figure 3]. We start the dissection from the right round ligament. The harmonic ultracision is used to desiccate and cut the right round ligament [Figure 4]. The uterovesical fold of the peritoneum is identified and opened from the round ligament on either side. The bladder is dissected down completely so that the uterine vessels on either side can be clearly seen. A window is created in the broad ligament close to the uterine vessels [Figure 5]. This helps visualization of the posterior aspect and prevents accidental suture placement through bowel loops. The ascending branch of the uterine artery is identified close to the isthmus. The uterine vessels are ligated at this level close to the uterus by transfixation using 1-0 delayed absorbable suture material [Figure 6] and [Figure 7]. It is rather challenging for the surgeon to suture the uterine arteries laparoscopically through the single-incision ports. Skill and expertise is essential to accomplish this suturing. The cornual pedicles are then desiccated and cut either using vessel sealing device or the harmonic ultracision [Figure 8] and [Figure 9]. The ligated uterine pedicles are cut. The uterosacrals and cardinal ligaments are desiccated and cut with the vessel sealing device or the harmonic ultracision. The vaginal vault is opened from one side [Figure 10]. The position of the myoma spiral is then changed so that the opposite side pedicles can be taken. The cornual, uterine, and uterosacral aspects of the other side are taken in a similar way and the vaginal vault is opened. The specimen is detached completely. The uterus is removed vaginally when feasible. In cases where the size of the uterus is large for vaginal delivery, a morcellator is introduced through the vault opening and the specimen is retrieved by morcellation with the claw forceps. This is done totally under laparoscopic guidance. If both ovaries need to be removed, the infundibulopelvic ligaments are desiccated and cut, and the ovaries are delivered vaginally. The vaginal vault is then sutured laparoscopically with No. 1 delayed absorbable interrupted figure-of-eight sutures [Figure 11] and [Figure 12]. In cases of previous caesarean sections where the bladder is densely adherent, we start from the left cornual structures. The uterovesical fold is opened and the bladder is dissected down by the lateral approach. A definitive plane above the level of the uterine vessels can be identified between the cervix and the bladder by this approach and the bladder is dissected down. The uterine vessels are then ligated on either side and the dissection is completed. 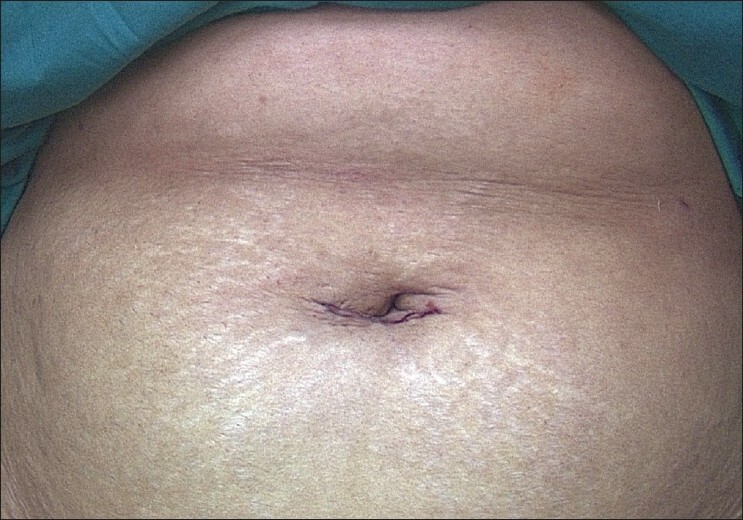 The single-incision is closed with subcuticular sutures using No 3-0 delayed absorbable suture [Figure 13]. This standard technique of total laparoscopic hysterectomy is performed in all cases with single-incision. However, in the case of very large myomas that render the procedure very difficult, certain modifications to the above technique may have to be adopted. 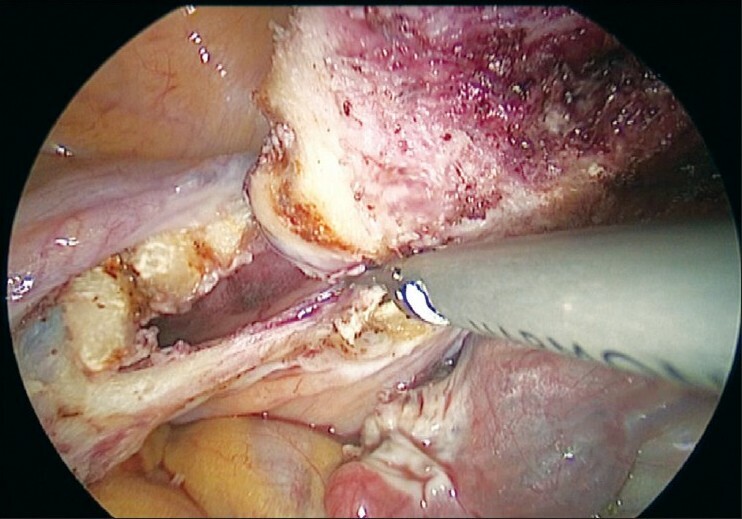 Since the first laparoscopic hysterectomy was reported by Reich et al in 1989,  the trend has been to change the hysterectomy approach from the open abdominal to a laparoscopic technique. The latest innovations in the field of minimally invasive surgery are to further reduce the morbidity associated with laparoscopic surgery and to improve cosmetic outcomes. Single-incision surgery has been reported to offer patients improved cosmetic outcomes as compared with multiport laparoscopic surgery, and possibly less postoperative pain,  although these potential benefits have yet to be demonstrated in a well-designed prospective trial. We in our center have been doing single-incision surgeries for total laparoscopic hysterectomy, laparoscopic myomectomy, and laparoscopic ovarian cyst excision. However, there are several limitations to this approach, including lack of triangulation, instrument crowding at the umbilicus, and difficulty with suturing using traditional sutures. It may be challenging to apply single-port surgery to more complex disorders such as very large myomas and severe pelvic adhesive disease. Lee et al have described single-port access laparoscopic-assisted vaginal hysterectomy using wound retractor and glove in 24 patients and concluded that it was safe and effective, and the procedure could be learned over a short period of time. 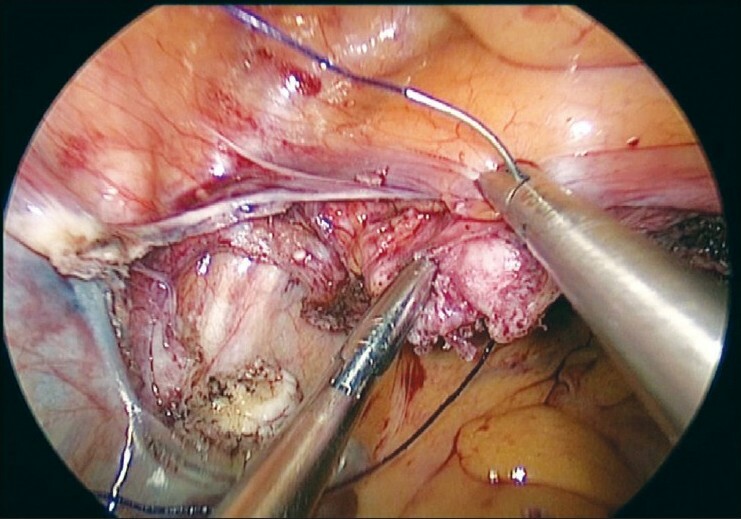 Yoon et al evaluated the feasibility, safety, and operative outcome of management of myomas and adenomyosis using single-port access subtotal hysterectomy with transcervical morcellation using a wound retractor and a surgical glove. Their study concluded that single-port access subtotal hysterectomy is safe and effective and results in almost no visible scar. With more experience and advanced instruments, this surgical procedure can offer a safe and effective option to hysterectomy with an excellent cosmetic outcome. 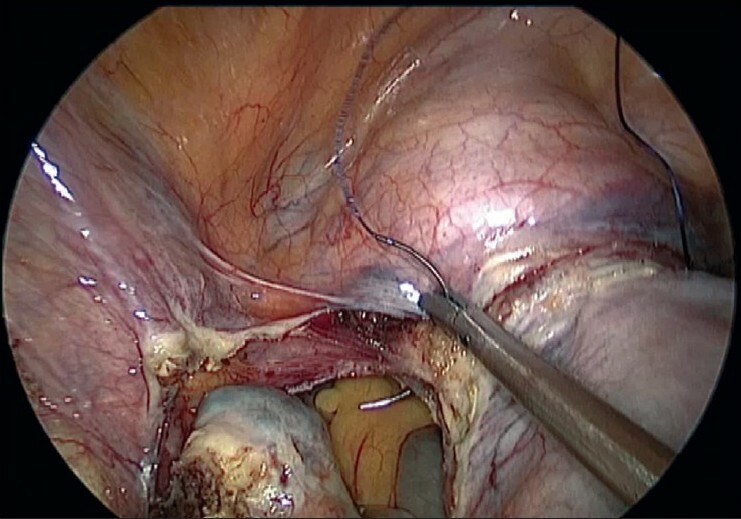 Langebrekke and Qvigstad described total laparoscopic hysterectomy through a single-port without vaginal surgery. They have reported vaginal closure using bidirectional barbed sutures. 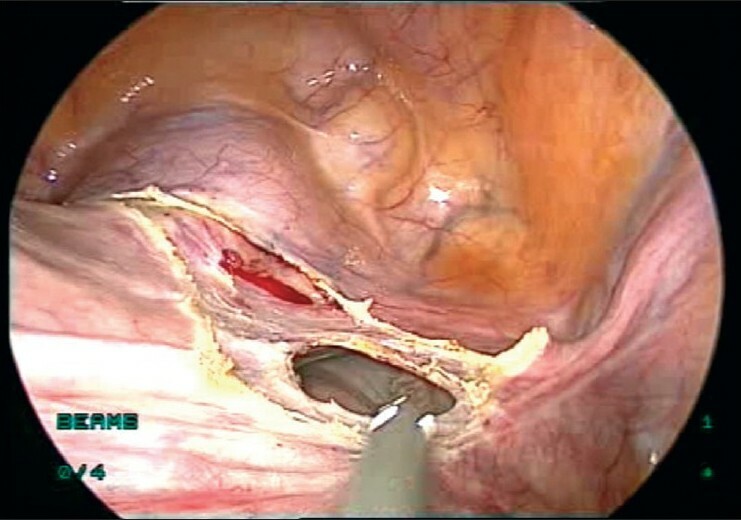 The technique of total laparoscopic hysterectomy is possible with single access; however, most surgeons find the suture technique difficult through a single port. Compared with traditional sutures, the benefits of the bidirectional self-retaining sutures with tissue retainers (barbs) include speed and economy of suture placement. There is no need of suture knotting, and by not using multiple suture loops, the tension can be more uniformly distributed along the length of the vaginal cuff. We have also used barbed sutures for closing the vaginal cuff in some patients. 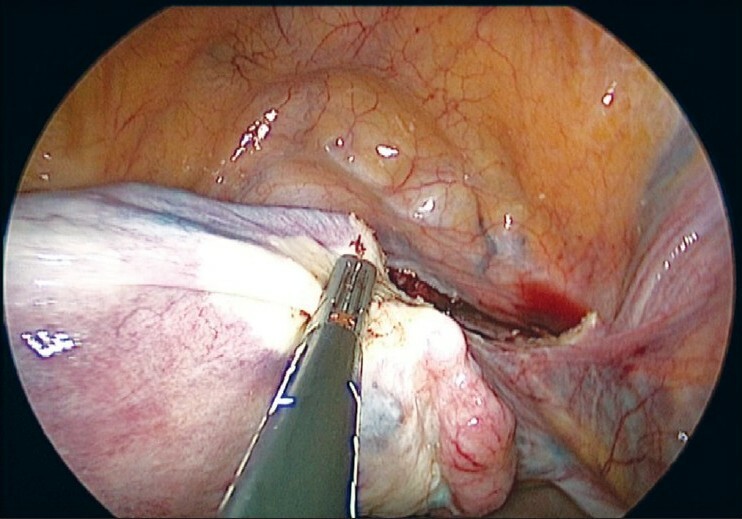 Using improved instruments and bidirectional self-retaining sutures, the laparoscopic technique is almost as easy to perform as with the traditional four-port access. 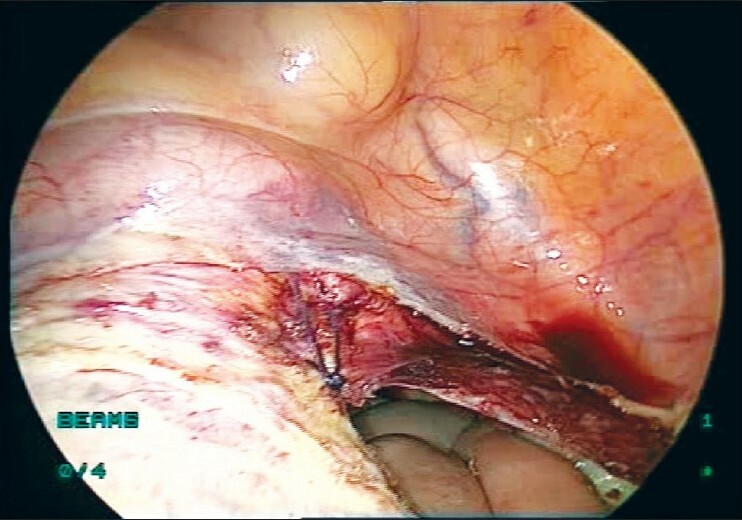 In conclusion, single-incision total laparoscopic hysterectomy is feasible in selected cases and is a safe cosmetic alternative to conventional multiport laparoscopy. 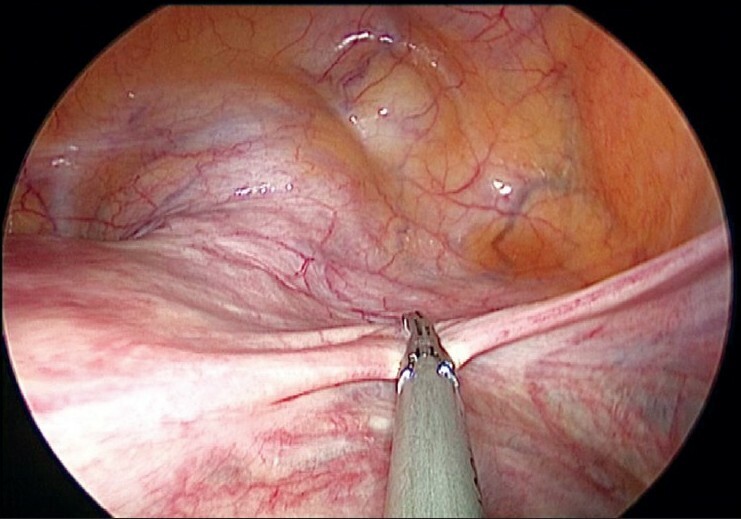 Currently, careful case selection is important so that these procedures can be explored safely, with a low threshold to convert to standard laparoscopy as indicated for safety and quality of care. 1. Desai MM, Stein R, Rao P, Canes D, Aron M, Rao PP, et al. Embryonic natural orifice transumbilical endoscopic surgery (E-NOTES) for advanced reconstruction: Initial experience. Urology 2009;73:182-7. 2. Wheeless CR Jr, Thompson BH. Laparoscopic sterilization. Review of 3600 cases. Obstet Gynecol 1973;42:751-8. 3. Kaouk JH, Haber GP, Goel RK, Desai MM, Aron M, Rackley RR, et al. Single-port laparoscopic surgery in urology: Initial experience. Urology 2008;71:3-6. 4. Pelosi MA, Pelosi MA 3 rd . 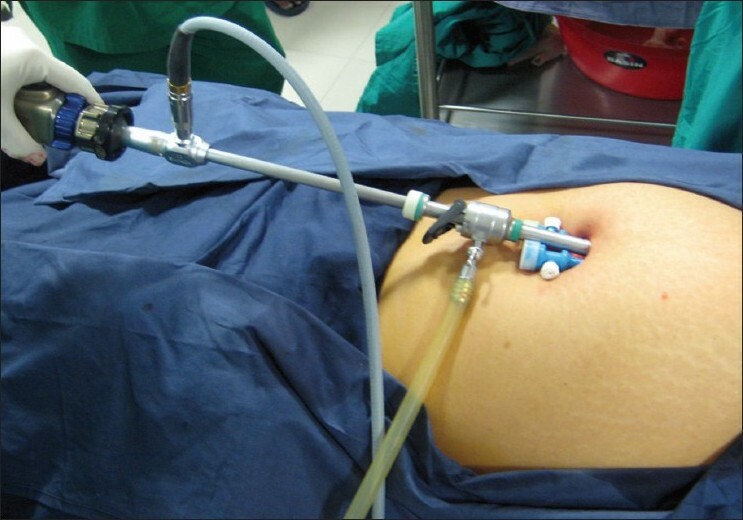 Laparoscopic supracervical hysterectomy using a single-umbilical puncture (minilaparoscopy). J Reprod Med 1992;37:777-84. 5. Sinha R, Hegde A. 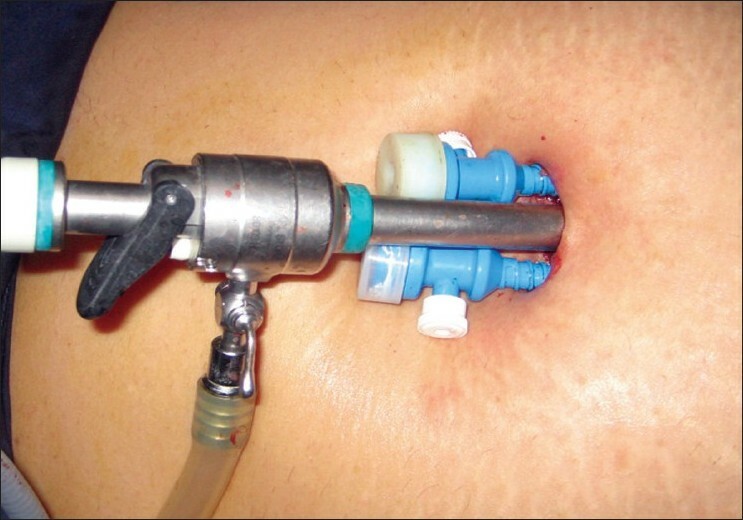 Safe entry techniques during laparoscopy. J Minim Invasive Gynecol. 2005;12:463-5. 6. Reich H, DeCaprio J, McGlynn F. Laparoscopic hysterectomy. J Gynecol Surg 1989;5:213-6. 7. Curcillo Ii PG, King SA, Podolsky ER, Rottman SJ. Single port access (SPA) minimal access surgery through a single-incision. Surg Technol Int 2009;18:19-25. 8. Lee YY, Kim TJ, Kim CJ, Kang H, Choi CH, Lee JW, et al. Single-Port Access Laparoscopic-Assisted Vaginal Hysterectomy: A Novel Method with a Wound Retractor and a Glove. J Minim Invasive Gynecol 2009;16:450-3. 9. Yoon G, Kim TJ, Lee YY, Kim CJ, Choi CH, Lee JW, et al. Single-Port Access Subtotal Hysterectomy with Transcervical Morcellation: A Pilot Study. J Minim Invasive Gynecol 2010;17:78-81. 10. Langebrekke A, Qvigstad E. Total Laparoscopic Hysterectomy with Single-Port Access without Vaginal Surgery. J Minim Invasive Gynecol 2009;16:609-11. Ichikawa, M. and Akira, S. and Hamano, E. and Ono, S. and Mine, K. and Takeshita, T.
Song, T. and Lee, Y. and Kim, M.-L. and Yoon, B.S. and Joo, W.-D. and Seong, S.J. and Kim, I.H. Paranjape, C. and Ojo, O.J. and Carne, D. and Guyton, D.
Fichera, A., Zoccali, M., Felice, C., Rubin, D.T. Ichikawa, M., Akira, S., Mine, K., Ohuchi, N., Iwasaki, N., Kurose, K., Takeshita, T.
Desai, S., Sinha, T., Mahal, A.